Sometimes happiness is as simple as being able to buy a handful of baég (about 50 grams at Php10) to put in a pot of pakbet (pinakbet), or mix in a stew of balatóng (munggo, mung beans) sauteed with chopped, ripe tomatoes. It becomes a joy, really, because the tree, or more appropriately the woody, high-growing shrub, bears only seasonally these light-green, textured, long spindly flowers that turn into a vegetable for us Northerners (Ilocanos and Pangasinenses). The shrub does not benefit from any blossom-inducing chemical spray since it is not much known outside of the Ilocos region, although I've heard it proliferates even in the Batangas area, where they eat it as a vegetable, too. But it is well that it is kept organic, since I'm well aware how access to fresh, unadulterated produce can be a pricey privilege in this time and place. Baég (Allaeanthus luzonicus) is endemic to the Philippines, also known as alokon or himbabao in Ilocano. It is rich in vitamins A, B and C, and contains calcium, phosphorus, potassium and iron. It is mixed in the Ilocano dish inabrao, or a vegetable stew of tomatoes, sitaw (string beans) and patani (fresh lima beans), flavored by pieces of grilled pork. In Pangasinan it is called baég, with the requisite Pangasinan guttural ę that all Filipinos outside of the province find so hard to pronounce (it is like the e in brother, or the second e in eagle - easy, right?). Baég makes any dish more aromatic, but only subtly so. 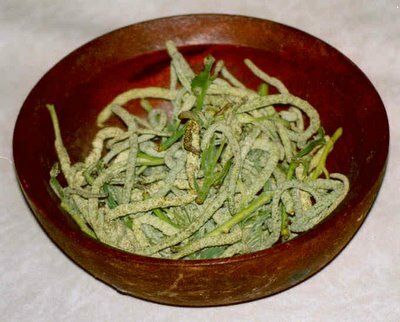 It adds texture, and additional roughage, to any vegetable dish that is sinágsagán (having as base stock seasoned with the salted, fermented fish paste bagóong). When cooked it turns vibrant green, soft and a bit slick. It can be had by itself, sauteed with shrimps, or in some places with bisukol or kuhol, snails, cooked in gata or coconut cream (definitely not in the Ilocos region). 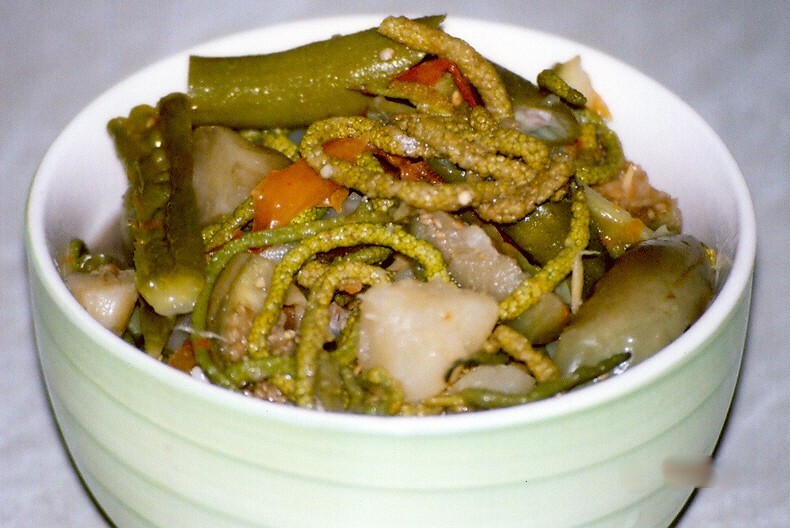 In Pangasinan it is most commonly cooked with pakbet, a mix of okra, eggplants, tomatoes, palya (ampalaya, bitter gourd/melon), all put together in a boiling pot of sinágsagán and agát (luya, ginger). The pakbet shown here (photo above) also contains cubes of kamote (sweet potato), also a common practice and to which I have some objections, but I allow it because of the kamote's beneficial contents (vitamin A, calcium, soluble fiber and resistant starch), especially for kids. It is now the season for baég. My cup runneth over. Alokon is good if you put it in dinengedeng, whereas (ilocanos). Always noticed this in the markets, never knew what they were...I have learned something today and it isn't even 8am yet! Oh, Stef, I've been searching all over for its scientific name but all searches end up in a Brazilian flower. I never even knew what it is called outside of Pangasinan until just two days ago, when I got to talk to somebody Ilocano. I'm trying to contact somebody from the National Museum, I hope they have a record of this. Will update the post as soon as I have some data. You're a true-blue Ilocana, Ces, hehe! Noemi, yes, it's the best way to eat alokon. MM, try it sometime with pakbet/dinengdeng. Wow. I have never seen this. And I love dinengdeng because my Ilocana lola always cooks dinengdeng although I dont remember this flower at all. I am getting quite educated by blogging. Thanks Kai! would love to introduce my tongue to baeg. another interesting thing. balatong is long beans in our region.It is munggo pala in pangasinan. Angelo, where is balatong green beans? Where pomelo is lukban? Alilay, great to hear from a Batangueňa! And even better to know you appreciate himbabao! Thanks for letting me know! the first time I tried alokon was with munggo and pork dish, it was really good...I feel like cooking something like that, pero di ko alam san makakakuha nyan. ano ba talaga yan? vine? or some kind of bulaklak? thanks. Munggo with baeg is a common dish in northern Luzon. Baeg grows as a woody shrub, and the blossoms and young leaves are the edible parts. There used to be one growing in my grandmother's lawn in Quezon City, but apart from that I don't know where else it is found, except in the market where Ilocano and Pangasinense vendors sell vegetables, and only during summer. i hopped into your blog...love this recipe, knows how to cook (thanks to my dad) but i unfortunately i cant...walang mga ganyang rekado dito sa AU. Broussonetia luzonica (hehe.. found it on lani's blog "chibog, chicka, lakwacha")! thanks for another informative post! while i'm not ilokano, i'd like to think that food is potentially one of the things that can bring us together as a nation, regardless of where we physically are. = ) sort of like a cultural rallying point for the Pinoy diaspora, like Bob Marley is for Jamaicans (good jammin? lol). ingat! Hello Researcher, I usually source info on local food from the Bureau of Agriculture and the DOST/FNRI. Also the Stuart Xchange website.